Delivery charges for orders placed and shipped by FireFlyBuys within the continental United States are included in the price of the product. Orders can be placed by phone to FireFlyBuys at 888-880-7322. Orders placed by phone to SnapSafe Corporate are subject to standard shipping charges in addition to product cost. Online orders are fulfilled by Firefly Buys on behalf of SnapSafe. Residents outside the continental United States must contact SnapSafe at info@snapsafe.com or 1-877-214-4470 to inquire about deliverability. See Important Delivery Considerations regarding orders that require freight delivery. Merchandise will be left at the desired threshold† and a responsible neighbor or representative must accompany the delivery team and sign for the delivery. In inclement weather, please provide a clear path – no ice, snow, or debris – from the street to the appropriate threshold*. Upon purchasing a SnapSafe® product, you will receive an order confirmation email that includes contact information for the shipping company that will complete the delivery of your product to your threshold*. It is essential to provide a phone number where you can be easily reached when you order your product as the shipping company will contact you directly to schedule a delivery date and time. See Important Delivery Considerations for information regarding delivery when an appointment cannot be scheduled. The shipping company will call you at the primary phone listed on your delivery order to confirm a four-hour delivery time window. Location that’s not easily accessed with a 53-foot semitrailer (18 wheeler). Upon delivery, it is in your best interest to make note of the carton and product condition on the delivery paperwork. Delivery does not include installation – it is neither expressed nor implied that the delivery company will assist in the assembly and/or installation of any SnapSafe product. Our delivery team will deliver and off-load the purchased SnapSafe item to the desired threshold*. Lift/hoist merchandise over banisters, or other obstructions, or through windows to complete the delivery of the product. Relocate any other items at said address. Perform carpentry, electrical, or plumbing work. The product will be returned if no delivery appointment is made within 48 hours of the shipping company contacting you. 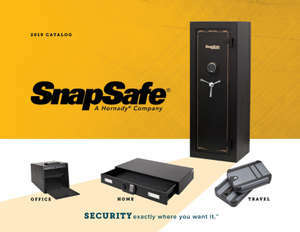 If the product was ordered direct from SnapSafe, the customer will be refunded the price of the returned product less the aforementioned built-in shipping fees. If the product was ordered from a second-party retailer the conditions of the retailer through whom the product was purchased will apply. *The threshold is defined as either the front door or in front of the garage for houses, and the first door of an apartment building.